I really don’t know what I think about the term “outsider art.” Wait, of course I know what I think! I always think it’s unfortunate when any art produced outside of the status quo obsession with ancient Greece and Rome, the Renaissance, and sales galleries is designated as somehow not quite as relevant. This also goes for the terms “primitive” and “naïve,” which I’ve discussed in other posts. When are we in the West going to accept that art is art no matter who produces it, if they are self-taught or not, if they’re of the “western tradition” or not, or if they’re aware of the current major trends in art? The term “outsider art” was coined in the 1970s as an English translation of the term Art Brut, French modernist Jean Dubuffet’s (1901-1985) label for his huge personal collection of such art that he had starting in the 1930s. Much of the art in this category was produced by artists who were either mentally challenged or physically handicapped. Some of the artists did not even think of themselves as such, and created work purely for personal fulfillment, never intending to show in galleries or museums. Another tendency in “outsider art” is that the work is usually created with little or no awareness or interest of other trends in art. The main difference between this art and so-called “naïve” or “primitive” art is that naïve or primitive artists remain in the mainstream of art, even if they fail to practice its style. They accept its subject, technique, and values because they hope for public recognition. James Castle was born deaf in Idaho and never strayed very far from the three farms worked by his family. He chose to never read, write, speak, or sign, preferring to immerse himself in his personal imagery. He spent almost all of his waking time producing his art, and even set up shows in chicken coops or sheds, documenting these “shows” with yet other works of art. Despite the fact that he taught himself how to paint, and used uncommon materials such as spit and soot, many of his interiors are solidly modeled forms. He copied letters or words from books in many of his pieces. He achieved velvety chiaroscuro in the use of spit, and most of his works have an overall gray tonality. 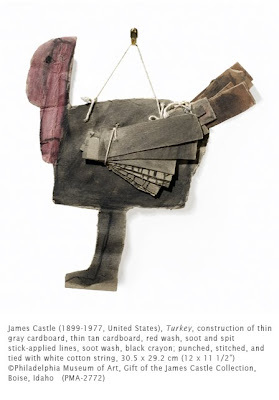 Unlike many outsider artists, Castle delighted in showing his work to visitors. The strength of Castle’s work comes from his dedication to his art. I hesitate to compare his work to any artists in mainstream 20th century art, except to point out that it compares favorably to works by artists such as Dubuffet, Kurt Schwitters (1887-1948), Marcel Duchamp (1887-1968) and some of the artists of the Arte Povera movement in Italy. I personally find his constructions to be some of his most interesting works, where he ingeniously manipulates scraps of cardboard to define form. I think I prefer the term “visionary art” to describe outsider art. The Philadelphia Museum of Art has a large collection of Castle’s work on their website.